Navigate to the “Object” properties. There you find a panel Avatar Shape IO. This panel displays a Preset selector and a subpanel with 4 main functions. By default this function creates a new Shape file with your current shape settings. This file can later be used for Load Shape (see above). Right besides the function you find a selector for the save destination. As mentioned above the default option is to save to File. But you can also save to a Blender textblock. In that case the slider values can be found in the Blender text editor panel. The values correspond to the shape settings in the SL viewer. Note: Some viewers support the upload of shape file to SL (e.g. Firestorm, Singularity). 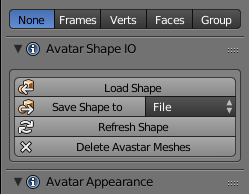 To see the file, switch to the Blender Text editor and locate Shape for: Avatar (Avatar stands for the name of the Armature). Useful when you need to update the shape in SL with the values from blender. This resets the Avastar meshes to the current Shape values. Useful together with the new custom shape key function (see below). Also if you messed up the Avastar meshes (by editing them) you can return the mesh back to the current shape slider values. Warning: if you added or removed vertices from the Avastar meshes, this function will fail! Remove all Shapes from the Avastar character. You will want this when you use the rig for non human characters where keeping the Avastar human meshes make no sense. When you load a blend file which contains an Avastar Character, then the Shape panel sometimes only displays the “Load Shape Editor” Button. This happens when you just have started Blender). Activating the button loads the shape setting controls. We added this for optimization purposes as it takes a few seconds to initialize the Avastar shape system.